What makes Task’s book compelling is its counter-intuitive arguments about the role of the academy and the counterculture of the 60s in the emergence of the Gay Rights Movement. While we tend to propagate nostalgic mythology about the peace and love message of the radicals of the 60s and envision the established liberalism of the academy as a bulwark of objective reason that would defend the homosexual against the irrationality of prejudice, Trask’s book paints a much different picture. Echoing Van Gosse’s sentiment that “homophobia united the left,” Trask shows how several figures of radical politics saw the homosexual not as a fellow dissident against the values of the establishment, but as a symbol of how a man can be emasculated by the established governmental and cultural institutions, reveling in his degraded servility. (88) While New Social Movements and radicals deemed homosexuals “not expressive enough” and saw the queer as a closet queen, “an emblem of the duplicity and anonymity characteristic of the invisible government,” the establishment liberals of the academy deemed queers “too expressive” and “poor students of the school, which demands a certain abstract aloofness.” (221) In short, for the established liberals of the academy, being queer meant you could not be objective enough, while for the radicals, being queer meant you were too used to assimilation and closetedness to be trusted. Trask’s book makes an important contribution toward understanding how the conceptualizations of homosexuality of the New Left, the countercultural radicals, and the liberal establishment in the academy influenced how the Gay Liberation Movement emerged in the 60s. In this light, the historical tension in lgbt politics between a strategy of emphasizing normality versus fighting against the very idea of normality and for an upheaval of how society views sexuality is illuminated as a product of the politics of the Left as a whole in the 50s and 60s. 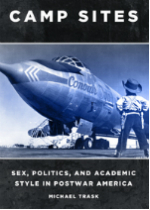 While Trask’s book is aimed at an academic audience with its detailed consideration of competing theories of higher education in the American academy in the 50s and 60s, its fresh readings of classic studies in camp by Esther Newton and Susan Sontag and its analyses of queerness and authenticity in novels by Kurt Vonnegut, Sylvia Plath, and Ralph Ellison among others should appeal to the literary and gay studies crowd. For those new to the idea of camp and gay culture in the 50s to the 70s, I might suggest beginning with David Halperin’s recent How To Be Gay, which introduces this history of camp and lgbt politics through personal experience and studies in popular culture. With Halperin as a primer and a compliment to Camp Sites, then Trask’s counterintuitive arguments about leftist politics in the 60s can be better appreciated and understood in their complexity. Chase Dimock is a PhD Candidate in the Program in Comparative and World Literature at the University of Illinois specializing in 20th Century American, French, and German Literature. He works in queer theory, Feminism, Marxism, and Psychoanalysis and is currently working on a dissertation on lost and forgotten queer writers of the Lost Generation and the American expatriate movement in Paris. He is originally from Los Angeles and holds a BA in Creative Writing and Political Science from UC Santa Cruz and an MA in Comparative Literature from The University of Illinois. He is a regular contributor to As It Ought To Be, an online magazine of arts and politics and the Co-editor of The Qouch, the official blog of The Queer Psychoanalysis Society.